China's Premier Li Keqiang, center, delivers a speech at the First World Conference on Tourism for Development at the Great Hall of the People in Beijing Thursday, May 19, 2016. China is using tourism as an important lever to revive its slowing economy as well as enhance its influence in international affairs. This was evident at the recent First World Conference on Tourism, when a senior Chinese official revealed the government's strategy on using tourism in diverse ways. 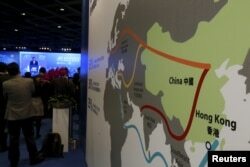 State media quoted Li Jinzao, head of China National Tourism Administration, as telling delegates at the conference that "China plans to send 150 million travelers to countries along the One Belt, One Road in the next five years.” These travelers are expected to spend $200 billion during the period, Li said, in a move to raise expectations among countries along the so-called Silk Road. Total Chinese spending on tourism would vault up three times from the present level to $460 billion by 2020, he said, adding that tourism contributed 10.8 percent to the country's Gross Domestic Product last year. Analysts find the figure about the contribution of tourism to the Chinese economy somewhat overstated, but there is no denying the government's enthusiasm to enlarge the role played by this industry. This was evident last week when State Council, the Chinese Cabinet, decided to open up low-altitude air space for high-end tourism and other industries. "I think that statistic is highly dubious. You have to stretch massively to reach that calculation by including things that don’t deserve to be in the figure," said Scott Kennedy, deputy director at the Freeman Chair in China Studies at the Center for Strategic & International Studies in Washington. China has reasons to feel it can use outbound tourism as a soft power to influence foreign policy. Governments across the world are adjusting their visa and other regulations to welcome the rising tide of Chinese tourists. Even Japan, which is a strong political rival of China, recently announced it would offer 10-year visas to Chinese businessmen and artists. Chinese travelers are changing preferences driven by either political sensitivities or their hunger for shopping for luxury goods. Hong Kong, an all-time favorite of Mainland travelers, is being ignored due to repeated protest demonstrations against the Chinese government. The latest casualty is Taiwan, where the new government is regarded less friendly to Beijing than the earlier one. FILE - Mainland Chinese tourists carry suitcases as they walk at a shopping district in Hong Kong, April 12, 2015. "South Korea and Thailand have overtaken Hong Kong as the most popular destinations; Europe beats North America as the most popular destination outside of Asia," CEIBS Adjunct Professor of Marketing Michel Gutsatz, said. The new trend is driven by what is known as "the Millennials" who spend more and travel more independently instead of relying on the old tradition of traveling in groups, he said. Chinese tourist spending has lifted up the economy of several Asian countries, including Thailand, Malaysia and Vietnam, in addition to benefiting the United States and parts of Europe, HSBC said in a report. The bank expects outbound Chinese tourists to reach 242 million in 2024, which is the total number of tourists received by Germany, Iran, Indonesia and Egypt combined in a single year. Chinese tourists account for more than 15 percent of all arrivals in Hong Kong, Korea, Taiwan, Vietnam, Thailand and Japan, the bank said. In fact, several countries, including Nepal and Sri Lanka, are known to have revised their relationship with China and India based on tourist arrivals, which are crucial to their local economies. The Global Business Travel Association (GBTA) recently announced that the business travel market in China has for the first time overtaken the United States to emerge as the biggest in the world. Chinese spent $291.2 billion on business travel in 2015, which was slightly higher than U.S. spending of $290.2 billion. The difference would widen in 2016 as the Chinese market would rise 10.1 percent while that of the US would grow at 1.9 percent, GBTA predicted. "China's growth rates, while relatively slow by Chinese standards, are still tremendously high compared to the rest of the world. Even with the difficult global economy, it was inevitable that China was on track become the global leader in business travel spend," said Colleen Lerro Gallagher, GBTA's Communications Director.